Leaving home town and fly to Zurich international airport – Switzerland, transfer to Meiringen by train. Evening meeting with your guide, trip orientation, gear check. We take a bus to Schwarzwaldalp and start our warm-up hike to Grindelwald by heading up to the Grosse Scheidegg Pass (6,540′). This is a gentle hike through forests of fir and rolling pastures, with views of the Wetterhorn above us.From the pass we have our first breathtaking views of the notorious Eiger (13,233′), whose formidable 5,000-foot north face has challenged and tragically defeated many climbers over the years. Descend to the famous resort village of Grindelwald. Grindelwald—“village of the glaciers”—is set at 3,460 feet in the Bernese Oberland and surrounded by an amphitheater of impressive peaks, including the Wetterhorn, Schreckhorn, Eiger, Monch, and Jungfrau. The hiking throughout the day is easy to moderate and on very well maintained trails and/or paved paths. Elevation gain is approximately 1,700 feet and the descent is about 3,100 feet. Hiking time is about five hours (6½ miles). Take the train to Grindelwald Grund and up to Alpiglen, then start hiking directly below the imposing north face of the Eiger and the summits of the Monch and Jungfrau. 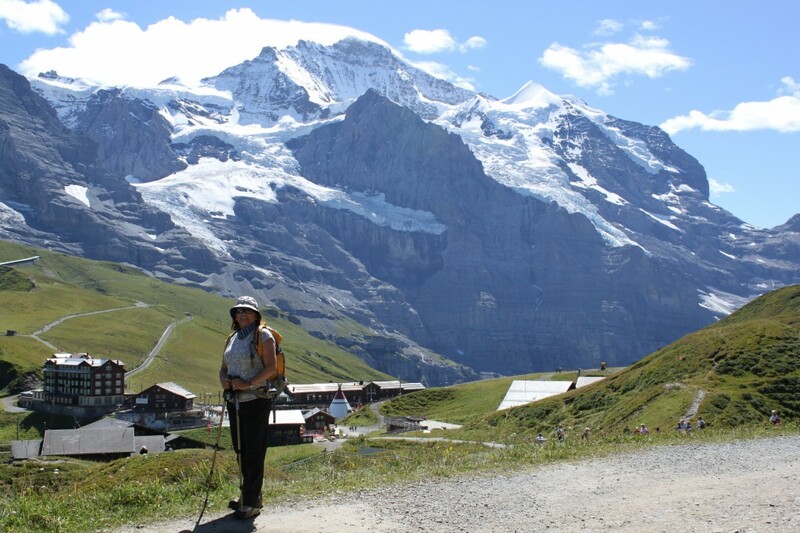 Hike up to Kleine Scheidegg (6,870′) for more outstanding glacier views. We gradually descend along a beautiful forest trail and gravel paths to the ski resort of Wengen and take a train down to Lauterbrunnen. Here we take the steep funicular up to Grutschalp, then continue hiking on a level path to Murren (5,454′). Weather permitting, we have impressive views of the north faces of the Gletscherhorn, Abeni Flue, Mittaghorn, Grosshorn, Breithorn, and Gspaltenhorn. Hiking time is about five hours (9 miles), with an elevation gain of 2,000 feet and loss of 2,600 feet. B,D Hotel. We start our three-hour ascent over very steep moraine and scree to Hohturli and Blüemlisalp Hut (9,447′), the highest pass of the trip. We can expect areas of exposure on this ascent. Once at the top we’ll have the glaciers and the high snowy peaks at our fingertips, and our rest and refueling break at the mountain hut will allow enough time for contemplation. Skirting glaciers, we descend to Oeschinensee Lake (5,300′) in the heart of the Bernese Oberland, then take a chairlift down to Kandersteg (3,900′). Overnight at hotel. Hiking time is about seven hours, with an elevation gain of 3,314 feet and descent of about 4,150 feet. Today’s hike is about 5½ miles and is quite strenuous with challenging trail conditions. A moderate to Strenuous tour , well balance. Few Strenuous days , few moderate days make this tour a perfect combination. However the hardest day require hiking over challenging steep terrain for 3 to 4 hours. Accomodations. Hotels, Ins, mountain huts.